We have a new phrase around our house that creates all kinds of giggles and imaginative responses. 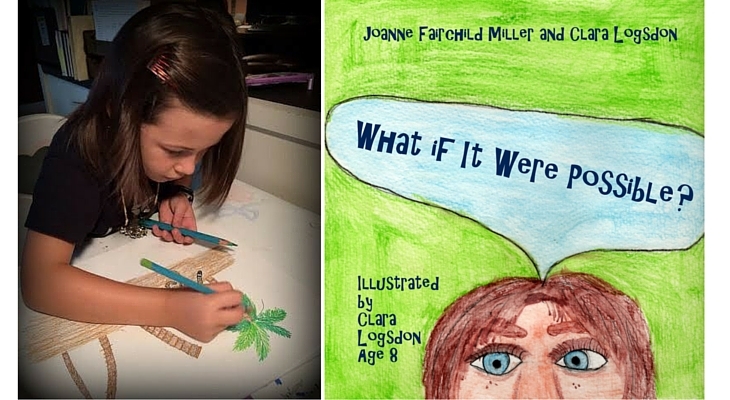 “What if it were possible?” My granddaughter Clara and I wrote a book with that title and, being top of mind for us, we often find ourselves asking, “What if it were possible to do this?” “What if it were possible to create this?” The whole family is joining in the fun. My favorite magazine is Writer’s Digest. In this month’s issue, I found a word I will adopt in my own vocabulary. Possibilitate: To render possible (early 19th century derivation). I love the sound of it. But I especially love the….well…..the possibilities! What if it were possible for a dog to climb a tree? “Anything can happen if you think it might” opens up amazing possibilities. Do you want a more intimate relationship? Do you want to garner respect from others? Do you want to create a Haven of Peace that others want to emulate and that your children know, without doubt, is a Sanctuary for them and their friends? Do you believe it’s possible? If you don’t, it probably won’t happen. I have discovered that any time I say “I can’t do that!” it is more likely I don’t want to do it! I simply don’t want to work that hard. Sometimes pushing through even the hardest tasks increases self-confidence and strength that passing the opportunity would never bring. If I hadn’t been willing to spend years intentionally creating a haven of peace, it wouldn’t have developed on its own. If I hadn’t persevered through writing my first children’s book, I would never have had the joy of being the author of five fun books that my grandchildren love to hear over and over. I would not have written two grown-up books and become a speaker and mentor to so many. But I had topossibilitate it all. I had to render it possible. And, admittedly, I had to do a lot of self-talk to push through to the end result…even shed a few tears. What if it were possible, you looked through Jesus’ eyes?